Anakin Skywalker – was a Force-sensitive Human male who served the Galactic Republic as a Jedi Knight and later served the Galactic Empire as the Sith Lord Darth Vader. Born to the slave Shmi Skywalker in 41.9 BBY, Anakin was conceived by midi-chlorians, the symbiotic organisms that allowed individuals to touch the Force, and he and his mother were brought to the desert planet of Tatooine to be the slaves of Gardulla the Hutt. They soon ended up as the property of the Toydarian Watto, and Skywalker exhibited exceptional piloting skills and a reputation for being able to build and repair anything even at a young age. In 32 BBY, Skywalker encountered the Jedi Qui-Gon Jinn and Padmé Amidala, and he helped them secure the parts they needed for their starship by winning the Boonta Eve Classic podracing event—only to learn that he had also won his freedom in doing so. Brown rawsilk. The texture should run vertical on the main body of the OT and along (parallel with) the sleeves. The crinkle texture on the collar should run parallel to the collar-OT seam Rawsilk is preferred. But other natural fabrics with the same weaving texture is accepted. Tan gauze or rawsilk type fabric. One tall, ribbed, resin-cast, reddish-brown (and may have, but is not required to have small gold buttons on each side)Worn on the right hip. One small, ribbed, resin-cast, reddish-brown (and may have, but is not required to have small gold buttons on each side)Worn on the right hand side on the back towards the belt closure, after the stud. One wide, ribbed, resin-cast, reddish-brown (and may have, but is not required to have small gold buttons on each side)Worn on the back left next to the centered keeper. Eight in total and measuring approximately 2.25-2.5 inches long by 0.5 inch wide. The Food Capsules are coloured two each: gold, silver, copper, gunmetal. Originally made from Staedtler Liquid Roller Point Pen caps with a half hemisphere glued to the opening. Original design, worn on the left hip between the studs. From center back of the belt and proceeding around the waist from the wearer’s right to left: brown rectangular box with centered gold button, silver button stud set, silver Food Capsule, Copper Food Capsule, leather pouch, gold Food Capsule, gunmetal Food Capsule, silver button stud set, center buckle, silver button stud set, Covertec Clip, gunmetal Food Capsule, gold Food Capsule, copper Food Capsule, silver Food Capsule, silver button stud set, reddish-brown ribbed box. AOTC Hero lightsaber hilt. 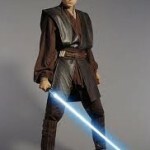 Master Replicas, Hasbro or costume build lightsaber matching that used in ROTS are accepted. Short. Cut shorter on the sides than on top, braid is required. Blue band on the braid place just below the earlobe, one red and one blue next to each other ¾ down on the braid, Natural hair or a synthetic wig is acceptable. Costumer must be clean shaven.